Nigel Twiston-Davies, who saddled Imperial Commander to finish a gallant nose second in Saturday’s Betfair Chase on the first day of the Northwest Racing Masters at Haydock Park, wants to take on Kauto Star again. After saddling the second in the opener on the second day of the Northwest Racing Masters, Benbens in the Weatherbys Bank Maiden Hurdle, the trainer said: “Imperial Commander is great today, not a bother on him. He was beaten literally a whisker - it is disappointing. That whisker was worth a lot of money. I was champion trainer (leading the race to be champion trainer this season) and now I am not. “I loved Paul Nicholls’ comment that Kauto Star will improve for the race, ours will improve even more - Imperial Commander is a great big burly horse and he will have needed the race every bit as much as Kauto Star did. “We don’t know about Kempton (for the King George) - Kempton is much more Kauto Star’s track, but Cheltenham..... let’s have a go. There is nowhere else to go except Kempton - the Lexus is a bit of a graveyard - it is abroad and there will be soft ground - I would much rather run in England. “We are really excited by Irish Raptor and Hello Bud this afternoon (in the totesport.com Becher Chase) - they are both superb jumpers and that is what they do best. Paddy has come back from this race and said the ground is nothing like as soft as envisaged. So he might be on the wrong horse as Irish Raptor could win. The Grand National is the target for both horses - they have got all that it takes. 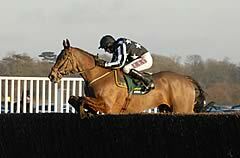 Paddy Brennan, Imperial Commander’s jockey, added: “There is still massive improvement in Imperial Commander. I lost four lengths at a fence and that is an awful lot of ground to lose at one fence. To get back at Kauto Star was always going to be very hard but my horse has really dug deep and tried all the way to the line. “I thought we had done it but brilliant Kauto Star - he is a wonderful horse and a great advertisement for racing - came out on top. “Ruby Walsh is the perfect role model for jump racing because he is a brilliant winner and even better loser. He thought he had lost and that was his reaction (to pat Paddy past the post). It is a lesson I need to learn - to handle losing as well as him. Ruby is a true professional and a brilliant ambassador for the sport.